of how few superhero accoutrements a character could display, and still be a member in good standing of that genre. C.B. (as he was usually addressed) didn't have super powers. His costume consisted of a hockey uniform, plus a cape he'd grabbed almost as an afterthought. He wore a mask only on the cover of his first issue — he had a secret identity, but never used it. His sidekick was nothing but a small monkey. He started out as teenage Chuck Chandler, a student at Custer Military Academy, and a star of the Custer hockey team. He was in the middle of a game when his father, a noted journalist, was shot by Iron Jaw, a notorious Nazi agent (so called because the lower part of his face had been blown off by a bomb thrown by the French Resistance, and replaced with metal). Still in his hockey suit, Chuck rushed to the hospital, throwing on the cape from his school uniform to keep warm. After learning the victim had a good chance of survival, he took a walk in a nearby park, where he rescued a monkey (which he named Squeeks) from a cruel organ grinder. But by the time he got back, Iron Jaw had overpowered the doctor and murdered the elder Chandler. Later in the story, Iron Jaw also killed Chuck's mom, and would've gotten Chuck too, if Squeeks hadn't saved him. Like Batman and The Hangman, who also became costumed crusaders after family members were murdered, Chuck swore to devote his life to bringing down criminals, especially Nazi criminals, and most especially of all, Iron Jaw. All this (and lots more) happened in a 13-page story appearing in Boy Comics #3 (April, 1942), published by Lev Gleason (the company that put out Daredevil and Crime Does Not Pay). It was actually the first issue of Boy, #s 1 and 2 having been titled Captain Battle. The cartoonist who wrote and drew the story (and who, as writer and editor, continued to have a strong say in C.B. 's continuing story) was Charles Biro, who also created or co-created Airboy and Steel Sterling. Iron Jaw continued as Crimebuster's nemesis until #15, when he was killed off. But you know how it is with super villains. 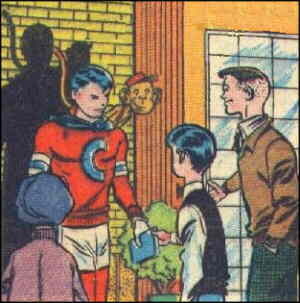 He was back in #60 (December, 1950), and went back to bedevilling C.B. at frequent intervals. But by then, C.B. was scarcely a superhero anymore. As the genre fell out of favor with the comics reading public, his adventures took on human interest overtones. Once again, readers were able to see that he had a life at school, tho since World War II was over, it was no longer a military academy but a regular high school called Curtis. There was still room for Iron Jaw, but not for long, as the heroics were being phased out. Eventually, things got so non-heroic, Squeeks got his own comic. He behaved just like any other funny animal for five issues, October 1953 through June 1954. About the time of Iron Jaw's return, C.B. started wearing regular clothes, because a girl told him he looked silly walking around in a hockey uniform all the time. His new outfit had roughly the same color scheme, and still displayed a big "C" on the chest, but it looked more like a sports star's letter (which, actually, it was all along) than a superhero insignia. The other kids still called him C.B. instead of Chuck — at least, until #112 (June, 1955), when he apparently decided enough was enough. (The fact that the word "crime", while not forbidden by the newly implemented Comics Code Authority, was frowned on, was probably a factor in the decision.) C.B. went back to being Chuck Chandler, a name he hadn't used in years, and remained Chuck Chandler for the rest of his days. Not that he had a whole lot of them left. Lev Gleason got out of the comic book business in 1956. The last issue of Boy Comics was #119, dated March of that year. Marvel Comics (which had already appropriated the name of one Lev Gleason character, Daredevil) brought out a minor supporting character named Crimebuster in Nova #13 (September, 1977). This one never went anywhere, and was killed off a few years later. AC Comics, which seems to regard practically any superhero of the 1940s and '50s as a worthy candidate for revival (they have versions of The Avenger, Captain Flash, Fighting Yank and many others as part of their universe) has done a couple of Crimebuster comics, including some reprints and a few new adventures. Even when they're from companies that have been out of business for generations, old superheroes never quite die. Text ©2004-05 Donald D. Markstein. Art © Lev Gleason.